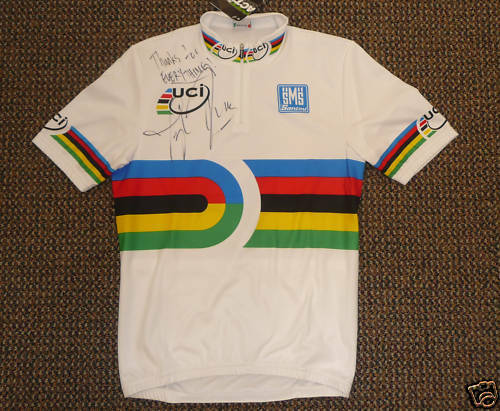 Taylor Phinney’s autographed World Championship jersey is a true collector’s item and the proceeds will benefit the USA Cycling Development Foundation. Taylor is the first American in 13 years to win an elite men’s world title on the track, capturing the rainbow jersey in the 4-kilometer individual pursuit in Poland last March, and he is the first American to win the Paris-Roubaix racing in the U23 men’s race last year as well. Taylor is racing for the Trek-Livestrong team this year, as well as participating in additional National Team activities. He has raced with the U.S. National Team for several years with funding provided in part from the USA Cycling Development Foundation. The son of two great American cyclists, Connie Carpenter and Davis Phinney, Taylor is on track to be a super star in the sport. Auction here.